This is a 103 mile counter-clockwise loop around Mt Lemmon, with about 28 miles of dirt roads and 75 miles of paved roads. Most of the dirt road has a good surface and you could easily ride it on a gravel bike if you were careful on the rougher places. I rode my 29″ mountain bike as I was by myself and didn’t want to take the risk of road bike parts breaking. I was glad of the shocks on the rockier parts of the dirt roads and on the washboard. Markers B and C on the map show where the ride switches between pavement and dirt. Marker B, a short way up the Redington Road hill, 23.7 miles after the start, is the start of the dirt. Marker C, 37.1 miles after the start of the dirt, shows where the ride went back to being pavement in 2014. Now the pavement starts 8.8 miles before this point, where you leave Pima Country and enter Pinal County. Markers B and C are represented by the vertical red lines in the elevation profile. As you can see, you climb quickly up the dirt part of Redington Road, then there a long descent. Then when you are back on paved road, there’s a lot more climbing up to Oracle. I started at Beyond Bread at Ina & Oracle so I could do the first section, over towards Tanque Verde, early, before there was much traffic. Also I wanted to be done by the time I got down to Ina Road again. I rode my mountain bike. I don’t like to carry a pack on my back, so I strapped a waist pack to the handlebars. This contained spare tubes, tools, food, and two extra water bottles, for a total of four water bottles. So, from Beyond Bread at Ina & Oracle, ride 23.7 miles to where the pavement ends on Redington Road. I went along Skyline and Sunrise then down Kolb to Tanque Verde. It might be slightly easier to go down Craycroft and along River. 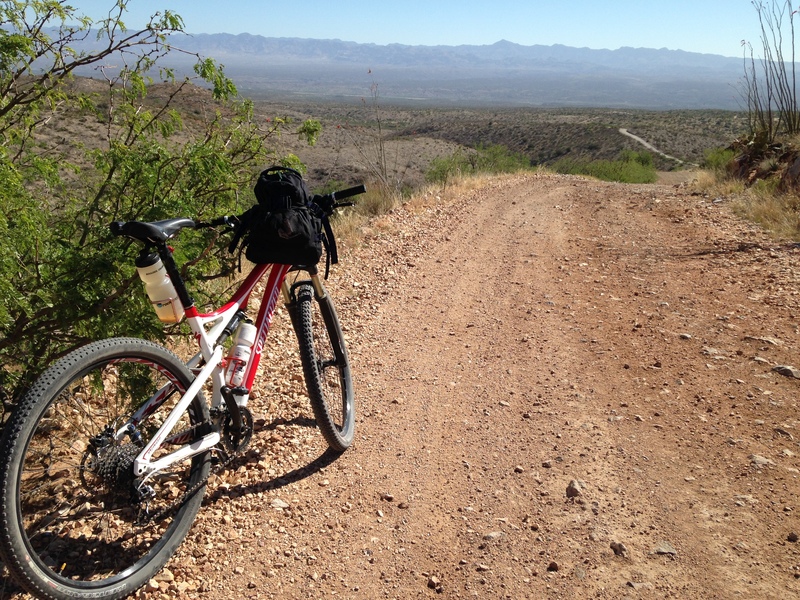 Then follow Tanque Verde until it becomes Redington Road and follow this up a few switchbacks to the dirt. Redington Road is easy to follow. You follow the obvious main road for 24 miles as it meanders up and down and around. The only place you might be concerned is between mile markers 14 and 15 where there’s a fork in the road. The road takes the left, bigger, fork. The weird thing is that you spend a surprising amount of time heading east, away from Mount Lemmon. Shortly after mile marker 27 you’ll reach a major intersection where the San Pedro River Road comes in from the right. Turn left towards San Manuel. From here, there are another 4.5 miles of dirt road before you get to the paved road, at the point where you enter Pinal County. When you reach the paved road, you’ve done about 28.5 miles of dirt, and now have about 51 miles of paved road left before you reach your car. As you see from the elevation profile, you still have quite a bit of climbing before you reach Oracle and the road flattens then becomes slightly downhill. The ride, which I did by myself on April 28, 2014, took me 9 hours 15 minutes which was less than I expected, but a lot slower than the fast, fit people ride it. I rode this loop again on 11/1/2017 with my friend Roger Peskett. 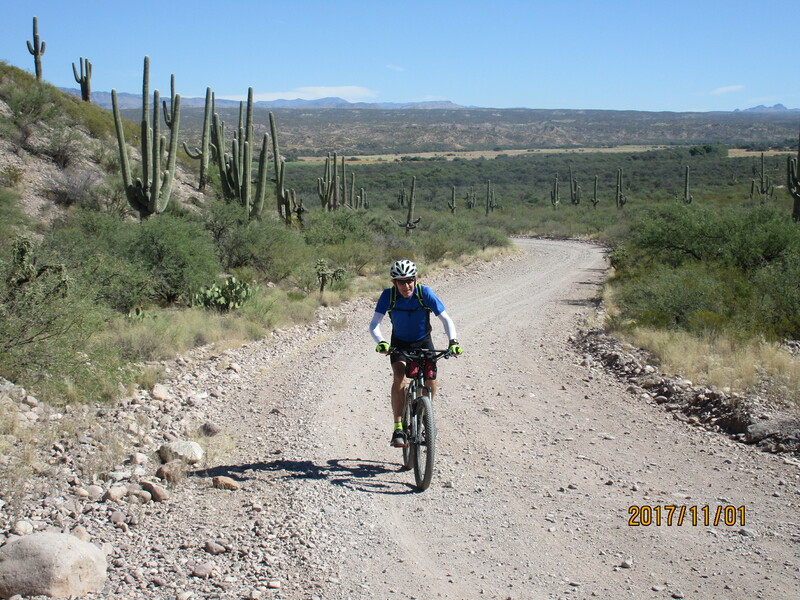 We rode it clockwise this time, which I now think is the better way to ride it as you finish over the beautiful 24 miles of Redington Pass, rather than with the tedious miles down from Oracle to Tucson. This was when I discovered that an additional 8.8 miles of the San Pedro River Road have been paved, making the ride a little easier. Perhaps the best place to start is at the Le Buzz parking area at the NE corner of Tanque Verde and Catalina Highway. Ride along Tanque Verde, Sabino Canyon, Kolb, Sunrise, Skyline, Ina then head north on Oracle Road to Oracle. To avoid yet more tedious riding we went into Oracle, stopping at the Circle K to replenish food and drink. At the center of Oracle turn right on the Mt Lemmon Road (the main road bears left following a a sign to San Manuel). Ride along this pretty rolling road for 3.3 miles then turn left on Webb Road. Follow this lovely road for 6 mainly downhill miles until you join the main road to San Manuel. 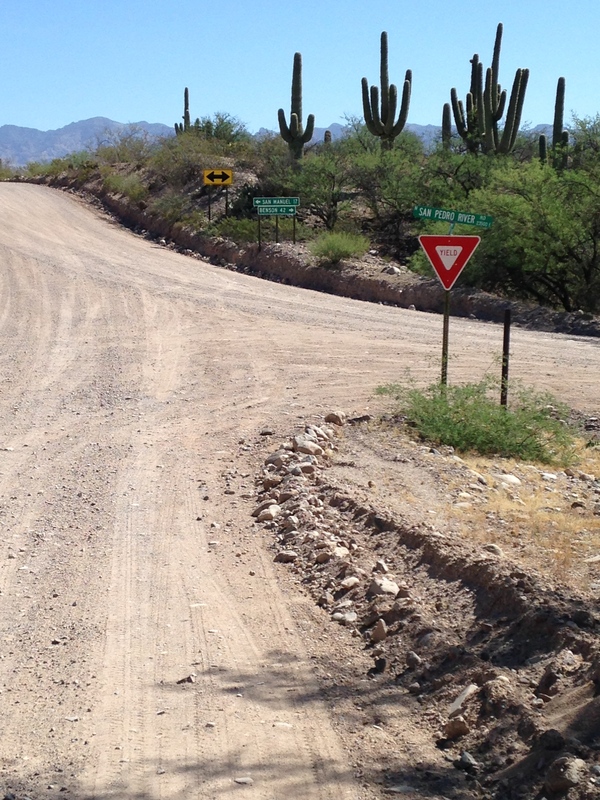 Turn right and follow the road until it finally turns to dirt at the Pinal / Pima County boundary. In another 4.7 miles turn right following the sign for Redington Road. The road immediately becomes rougher, and in a short distance it splits. Stay left. You now climb gradually over rolling terrain for about 17.4 miles to the large rest area on the right that symbolizes the “top” of the climb. Another 6.7 mainly downhill miles takes you to the end of the dirt. Now it’s about 8 miles of paved road back to Le Buzz. Instead of looping around Mt Lemmon, you can climb Mt Lemmon from the north, starting over Redington Road. Great inspiration! I’m going for a mountain bike ride today yippee!